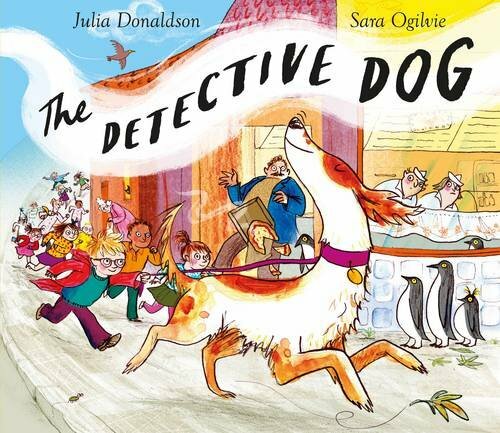 We’re very excited about this one… Britain’s best-selling picture book author and local resident, the wonderful Julia Donaldson has chosen to collaborate with one of our favourite illustrators, Sara Ogilvie, to create a fantastic, fast-paced romp, The Detective Dog. Nell can sniff out the solution to any mystery with her amazing nose, she solves any crime and also looks after her messy boy owner Peter, retrieving his belongings from the most unlikely places. That’s what she does Tuesday to Sunday, but on Mondays Nell has another very important job – she follows the smell of books and goes to school with Peter and listens to the children read. When all the school’s books disappear, who better to sniff them out than Detective Dog Nell? This an absolutely lovely story in praise of books and libraries and children and dogs, illuminated by Ogilvy’s fabulously expressive drawings.